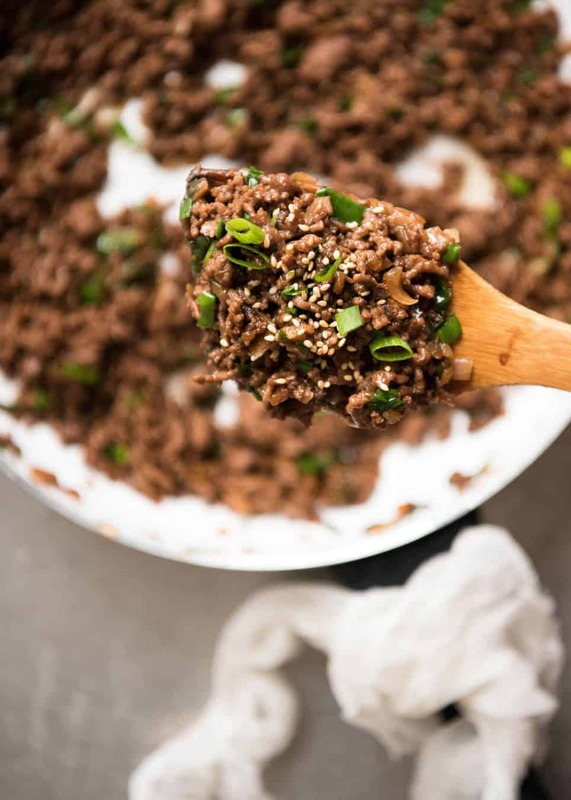 A terrific super quick stir fry made using beef mince (ground beef) and just a handful of staple Asian condiments. 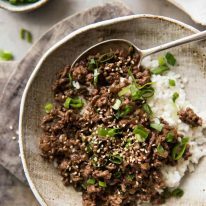 Pile it on rice to make Asian Beef Bowls that you can have on the table in less than 15 minutes! Also, don’t miss the popular ramen noodle version of this recipe – Asian Beef Ramen Noodles! SUPER QUICK BEEF MINCE RECIPE! This one is for all those nights when you peer into your fridge, find a packet of beef mince and are completely uninspired to make Spag Bol – yet again. This is also one for all those nights when you’ve been baking, filming and photographing cupcakes all day, and you swear you don’t have the energy to make anything for dinner but your mother brain washed you so well, you feel guilty for even thinking about picking up the phone to order home delivery. 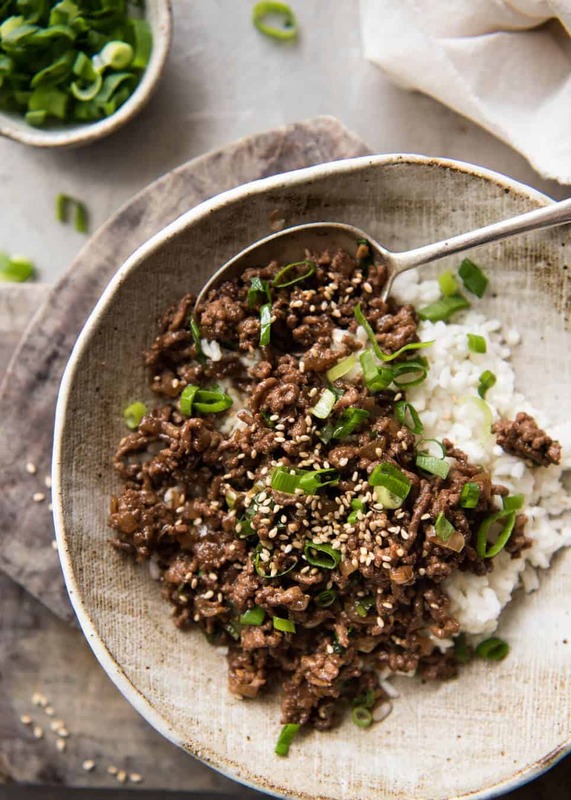 I’ve made a video for these Asian Beef Bowls (it’s below the recipe). And it’s barely 30 seconds long. Because it really is incredibly quick to make. And for something so fast and easy, you are going to be amazed how great it tastes. It’s everything you know and love about Chinese food. Savoury, touch of sweet, depth of flavour. Perfectly juicy (you can see how juicy it is in the video! ), and unlike stir fries, you don’t need a sauce because the beef mixes through the rice, dispersing flavour all throughout it. 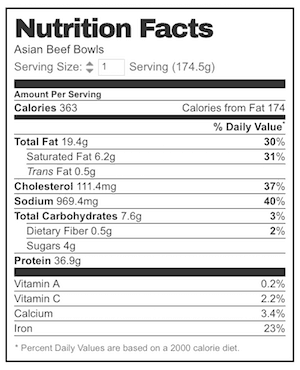 This is not a traditional Chinese or other Asian recipe, hence the obscure name “Asian Beef Bowls”. 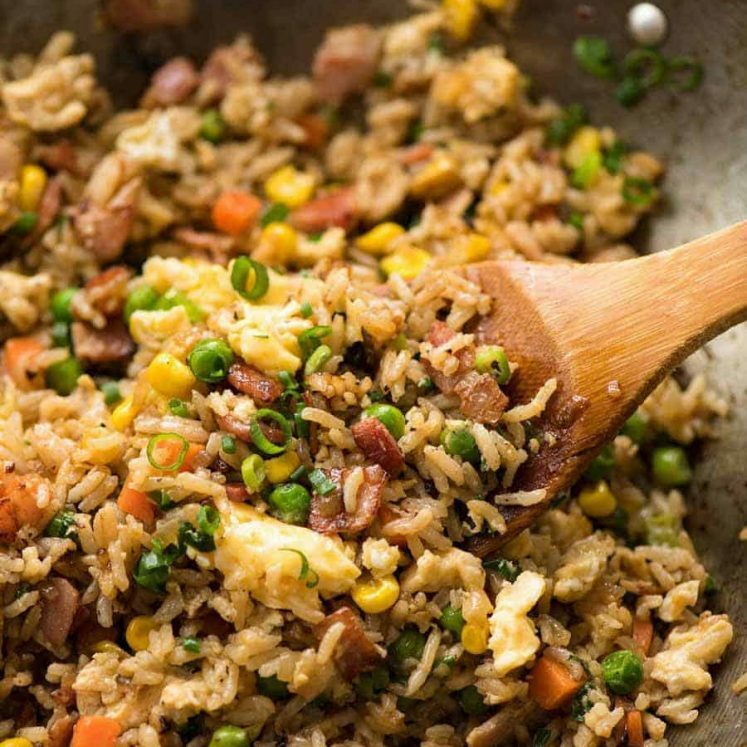 However, if you have ever made a Chinese stir fry – or in fact, any Chinese recipe – you will likely instantly recognise all the ingredients in the sauce. No Western ingredients. This is made with 100% authentic Asian ingredients. And when you take the first bite, it will be so familiar to you. Because the sauce is so similar to many stir fries, yet an exact replica of none! Keeping today’s post short and simple because I actually was baking cupcakes all day. Regular readers know I’m a bit pedantic about recipe testing when it comes to baked goods. That’s why you only see sweet recipes every few weeks around here. The recipe testing kills me!! 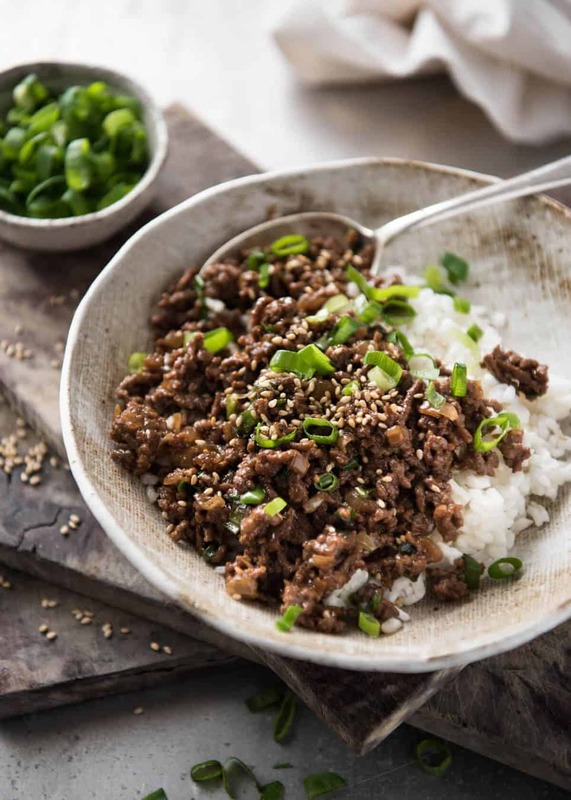 A fabulous quick stir fry made using beef mince (ground beef) <<-- No slicing meat! It's not saucy like usual stir fries, you don't need sauce because the beef mixes through the rice, and it has plenty of flavour! Recipe video is below so you can see how juicy and flavourful this looks. 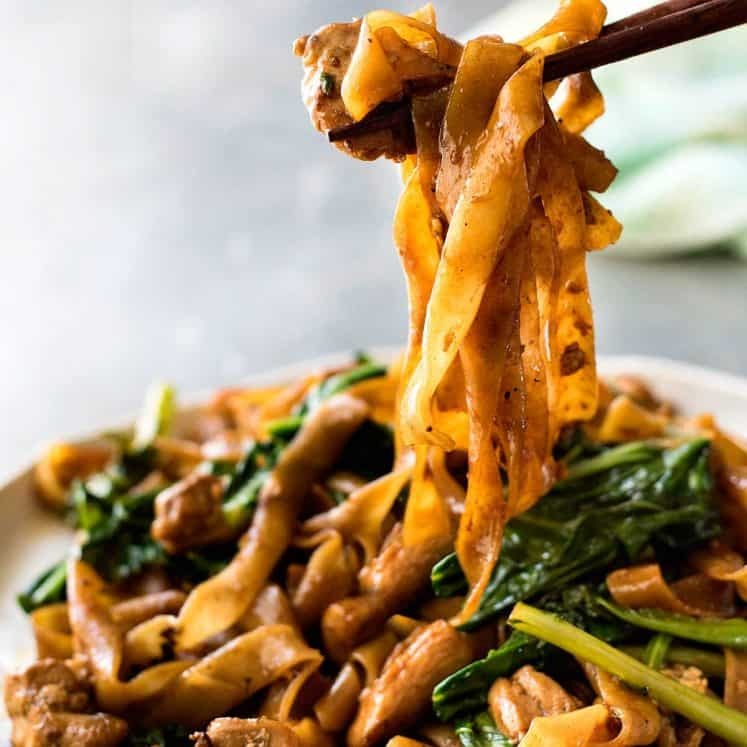 Unlike most stir fries, I make this in a large fry pan - more suitable for cooking the amount of beef I use in this recipe. Great recipe to add diced or julienned veggies! Heat oil in a large skillet over high heat. Add garlic and onion, cook for 1 minute or until onion starts browning. Once the beef has all changed from red to brown, add Sauce. Cook for a further 2 minutes, or until Sauce has evaporated and beef is cooked. If you want the beef cooked more, add a splash of water and keep cooking (I don't do this). Stir through shallots, then serve over rice, garnished with more shallots and sesame seeds, if desired. 1. If you can't consume alcohol, add 1/4 cup of chicken stock/broth. The sauce will take around 3 minutes to evaporate. The end result will be very similar. 2. This recipe calls for DARK soy sauce. It has more flavour than light and all purpose soy sauce, and makes the food a deeper brown colour. 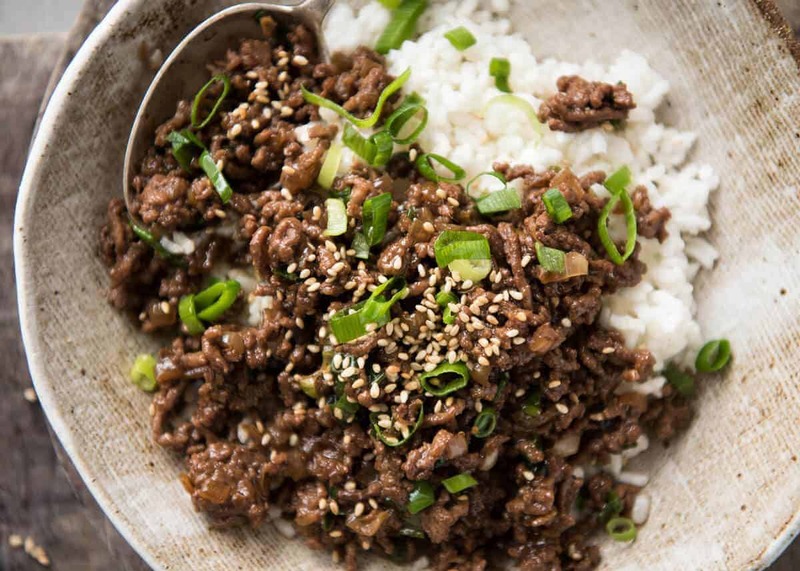 You can substitute with all purpose soy sauce, but the beef colour won't be as brown) or reduce to 2 tbsp if substituting with light soy sauce. 3. FROZEN RICE: Freezing rice is common practice in Asia. All my relatives in Japan do it! Use medium or short grain rice - they are slightly stickier than long grain, basmati, jasmine rice so they reheat better i.e. they don't dry out as much. To reheat the rice, sprinkle with water and microwave from frozen for 1/ 1/2 - 2 minutes. 3. Nutrition per serving, excluding rice. I did collapse on the couch as soon as I finished this post. Dozer followed. Hey Nagi! I made this for dinner just tonight – and the family loved it! And even requested for me to repeat it some time this week. heehee.. At first I thought it might be a tad too salty, but not at all! Thanks again! Working late. Added steamed brocolli and carrot, she devoured this (so did I). Leftovers for lunch tomorrow yay! I cooked this tonight and it was very simple and oh so tasty! I also added some vegetables after browning the meat. Nagi, I have now cooked several of your recipes and never been disappointed. You are my go-to culinary guru these days! It is great to follow someone who creates recipes with everydsy ingredients for us not-so-cheffy cooks . Thank you for sharing your talent. Cooked tonight, had to modify a bit as suggested, didn’t have rice wine and added celery and carrot, OMG!!! I just made this the other day and it is delicious!! 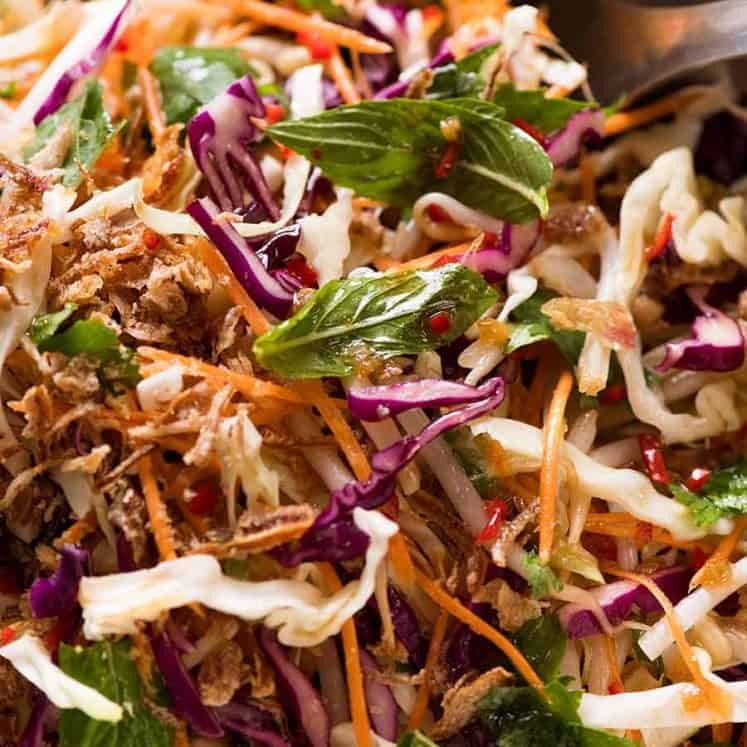 I love that it is so quick to put together with a few simple ingredients yet so flavorful. Will be one of my go-to recipes for sure! 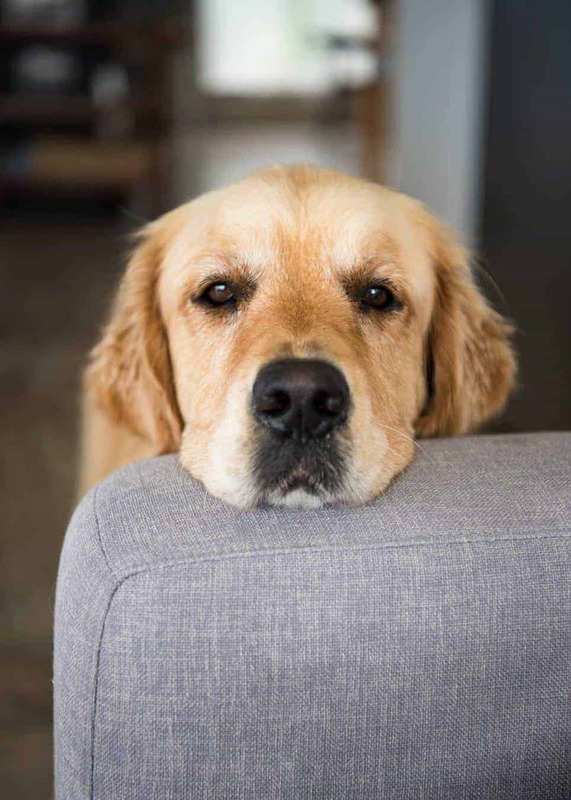 Hi Nagi. I tried your receipe and indeed its delicious. I add some scramble egg inside just because i am lazy and just everything in and in came out great! So quick, easy, delicious & sooo not spag bol…..just what I was after! Hi Nagi, made this tonight and it was tasty and easy. I added two chopped up dried chilies to the onion and garlic segment as we like a bit of heat and it worked a treat. Love your work, and thanks for the recipe. My wife and I love this dish. It’s so easy and fast, too. I, also, couldn’t find dark soy sauce in our local store or in a big chain supermarket, so I had to use the common type. This is a dish we will enjoy regularly. Thanks much. Another dinner winner! This was so easy and so delicious! I’m disappointed to discover my only local supermarket stopped selling dark soy sauce, so I had to substitute with normal soy sauce, but it was still amazing! Thank you, Nagi! Hi Nagi, tonight I made this for dinner along with your mom’s recipe for Japanese rice. Everything was delicious! One of the best results from a package of ground beef I’ve ever had. I added some snow peas and it was really good, next time I might try some shredded cabbage and carrots like another commenter recommended. Thanks for the great recipe; it will be going into our regular rotation! So good! And yes, nice not to be making a tomato based spaghetti. I added three cups of grated carrots/zucchini to the mix and doubled the sauce to make up for the extra stir fry ingredients. I added French beans and mushrooms, (to make myself feel good about eating SOME fibre) and doubled the sauce, It was good! And so quick and easy. Definitely cooking this again, thanks! Hi Nagi, Well what can I say but yum yum yum! This would have to be the tastiest easiest mince dish I have ever cooked in 15 minutes. I added some stir fry vegetables as well and oh boy it was amazing. My family love this one.